Quarterback: Again with the quarterback? Yeah, well, whaddyagonnado? Christian Ponder broke out his shovel pass to nice effect except offensive coordinator Bill Musgrave got too cute and called the play one too many times. Fool me once, shame on you; fool me twice, shame on me; fool me thrice, well, it usually doesn’t happen. Ponder did have some weak moments: An early completion to Percy Harvin had a tad too much touch on it and could’ve gone for a pick six, had the defender been a half step quicker. It’s quibbling, but the touch pass to Visanthe Shiancoe in the third quarter on a flag route might’ve had just a wee bit too much air under it, allowing the safety enough time to knock it away at the last second but to be fair, there was no one in the vicinity to occupy the safety during the play, either. He had at least two passes batted down at the line but for one, a slant to Kyle Rudolph, Ponder was trying to fit the ball into a super tight window and the ball looked like it would’ve been behind Rudolph, making for a difficult catch even for him. Ponder threw two deep balls down the sideline; one to Devin Aromashodu and another to Kyle Rudolph, both of which sailed out of bounds. He doesn’t seem to have the accuracy needed on those passes. That, or his receivers aren’t giving him enough cushion along the sidelines. The fumbled exchange between him and Adrian Peterson in the third quarter was all on Ponder for failing to place the ball directly in Peterson’s bread basket. On the plus side, he showed nice touch on a third down conversion to Visanthe Shiancoe, dropped the ball nicely over a defender to Micheal Jenkins for a 24 yard pass. Late in the third quarter, Ponder opted to throw the ball away when he couldn’t find an open man because Devin Aromashodu was being mugged. Throwing the ball away is a simple, but sometimes difficult, lesson for rookie quarterbacks to learn. Two turnovers converted to touchdowns: We didn’t see much of that with Donovan McNabb calling the signals. I haven’t heard Ponder use the hard count yet to draw defenders offsides. Maybe Leslie Frazier should put him on a plane to Hattiesburg to get some lessons from Brett Favre during the bye. Have you noticed that Ponder tends to dip his head just after faking the handoff on play-action passes? If he’s doing that consistently, that’s an easy tipoff for defenders. Adrian Peterson: Peterson has got to be lovin’ the first two starts of his rookie quarterback’s career. The ability of the Vikings to open up the passing game with a quarterback who can hit receivers for more than eight yards has definitely opened up the running game for Adrian Peterson, even if he was bottled up for the first half. Sunday was the best receiving game of Peterson’s career; with the Panthers protecting deep, Adrian was able to take advantage of soft underneath coverage to find some space. The shovel passes worked well–twice–and the screen that AP took untouched for a touchdown was perfectly executed. The highlight, though, was his rushing touchdown where he maintained his balance while he pirouetted into the end zone. Defense stops the running game in the first half, so you get the ball to Peterson in space using the passing game…which opens up the running game. Can we call that an offensive adjustment? 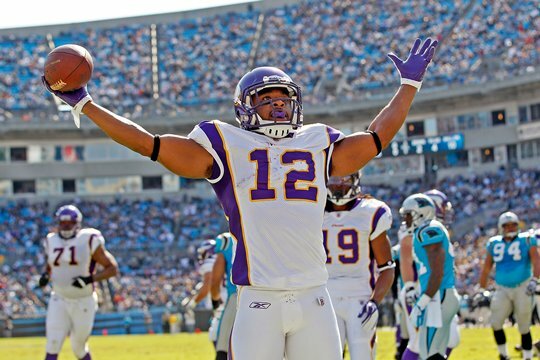 Percy Harvin: In addition to the pivotal third down conversion/spin move play, It was all Percy on the Vikings first scoring drive with a plow up the middle followed by his ten yard touchdown trot. He was the beneficiary of a good seal block by Joe Berger on the first run and Berger got to the second level to hit a linebacker and helped create a crease on the touchdown run but it was Kyle Rudolph‘s block in the backfield that sprung Harvin. Harvin himself was a factor as a blocker as well. On AP’s 22 yard shovel scamper, it was a fantastic block by Percy on a linebacker that paved the way. But then there was that fumble in the red zone. Offensive Line: The fact that I don’t have much to complain about either means that this group is starting to come together or that they played a team that is horrible against the run (but the pass protection was decent, too) or both. Whatever. I’ll take it. Joe Webb: Free Joe Webb! Yeah, he saw some time as a decoy at receiver but what, exactly, is the point if you don’t get the ball in his hands occasionally? Webb’s got speed; why not utilize it on the outside? Jared Allen: Allen was amazing yet again. He got only one sack against Jordon Gross but it was beautifully executed and timed. But Allen also recovered the fumble E.J. Henderson created, chased down Cam Newton during a run on which he lost contain, and batted down a pass that very easily could’ve been intercepted. Here’s a suggestion for Allen: Swap out those lineman gloves for receivers gloves that have the tacky surface all over the palm. They might help you hang on to a few more. Erin Henderson: The little brother is coming into his own as a linebacker while you got to wonder about the long-term viability of older brother E.J. Erin Henderson applied pressure that his bother cashed in for a strip sack of Newton, he got in throwing lanes to disrupt passes, he dropped DeAngelo Williams for a three yard loss, he broke up a pass that Jamarca Sanford could’ve picked off (it happens), he stopped Newton short on a run in the third quarter to force a punt, and finally, Erin knocked down a pass to tight end Greg Olsen. Asher Allen: Given the assignment, covering Steve Smith all day long, Allen held up pretty well considering he’s a dime back. He had superb coverage on the corner pass to Smith down to the one yard line. Only a perfect pass and great catch made that play successful, so not much you can do about that. And he just plain got beat by Smith for his only touchdown. Smith ended up with seven catches for 100 yards and a touchdown. The numbers don’t look pretty but Smith didn’t beat the hell out of the Vikings on Sunday as he has done in the past. Husain Abdullah: I know, I know, Abdullah was tooooooaaaasted by a tight end for a touchdown, but aside from that play, he actually had a pretty good game. His hard hit broke up a pass on a play that didn’t count because Brian Robison drew a holding penalty; still, nice play. His great coverage and tackle forced a three-and-out on another series. He got the sack of Cam Newton that Chad Greenway missed. And he knocked away a pass to Greg Olsen in the end zone during the final seconds. Ryan Longwell: Two ridiculous shanks so far this year? What’s up with that?!? Happy Birthday today to guard Steve Hitchinson (34)!